To survive, Catholic schools need to embrace what makes them unique, rather than ape their public school counterparts. Summer no longer stretches long and lazy ahead, with the next school year no more than a weakling shade. In a few short weeks, my husband returns to teaching theology at a Catholic high school, and, even more alarming, a little after that our oldest child enters kindergarten at our parish school. Even as the summer shrinks before my forward gaze, Catholic education and all that it entails seems to simmer and percolate in my mind and heart with unceasing intensity. Will our son thrive in the parish school? Will the local Catholic schools manage to stay afloat, while the last few decades have seen a steady stream of schools closing their doors forever? The importance of Catholic education cannot be measured, and the need for revival—indeed, the need for reform in many instances—stands in sharp relief against the background of a sickly culture. 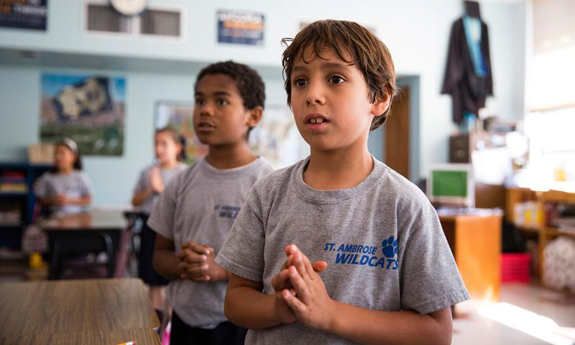 In order for Catholic schools not only to survive, but to thrive, they must be radically Catholic, both in education and culture, and offer a formation entirely unlike that offered by public schools. In my city, two Catholic school buildings stand eerily vacant. Granted, there are still three up and running, but only one of those has not been consolidated with another in order to survive. That scenario is all too familiar across the United States. A January 2016 article in Our Sunday Visitor grimly reports: “According to the National Catholic Educational Association, since the 2005 academic year, at least 1,648 Catholic schools were reported closed or consolidated while only 336 school openings were reported. The number of total enrolled students declined by almost 20 percent.” The article goes on to say that elementary schools in particular have suffered, to the tune of a 20-30 percent enrollment decline since 2005 across the country. Everywhere, every year, diocesan administrators scramble to maintain enrollment. The general consensus is that rising costs of Catholic education deter most people from sending their children to Catholic schools. While expense is an important factor, one needs only to look at the few, markedly different schools that are thriving to learn that there are other important elements to the problem—and possible solutions. Father Lewinski’s solution was to turn to Blessed Pier Giorgio Frassati, for whom the school is named, and allow Pier Giorgio’s priorities to inform the education offered at the school, because, as Lewinski points out, “Ultimately, we are not just trying to raise good Catholic children and citizens. We are trying to raise saints.” Inspired by Pier Giorgio, the school’s leadership wrote up basic guidelines, outlining their priorities for the school, based on the spirituality of the saint. “We wrote a spiritual charter that highlights his five charisms: a spirit of the Beatitudes, healthy relationships, the centrality of the Eucharist, discipleship and mission, and perseverance,” Father Lewinski said. “When we interviewed potential teachers, they had to be practicing Catholics. We asked them how they were going to share the Faith with enthusiasm and joy. We were asking them to buy into our vision. They might have been the best math or science teachers, but we have chosen something more.” The school opened in 2010, and there are now approximately 120 students enrolled in grades 6, 7, and 8. The New England Classical Academy, Claremont, New Hampshire: Founded in 2009 by former Swiss Guard Mario Enzler and his wife Julie, the New England Classical Academy has grown from five students to 160, and graduated seniors with Ivy League scholarships. Although the school receives no state or diocesan funding, and is located in one of the poorest counties of New Hampshire, it has thrived as a non-profit because of the classical education it offers. Says Enzler, “We challenge and engage them using the Socratic method, so you read and then discuss. … Our goal is that our students leave the academy as free, wise, and virtuous young men and women who will be prepared for college, any kind of career or home life that the Lord will indicate for them, but a life enriched with the richness of Western culture.” Catholic and classical are two words that would best describe the academy, and apparently, those two elements have attracted a surprising, quickly-rising enrollment. These three schools are simply a few pieces of the evidence, which increasingly shows that two things increase enrollment: embracing and proclaiming a Catholic identity, and switching to a classical curriculum. And with rising enrollment, one could more reasonably hope that tuition rates will stabilize instead of steadily climb. It makes perfect sense, really, that embracing Catholic identity at Catholic schools and offering a unique education will increase enrollment. Yes, a few will turn away embittered. But watering down or avoiding the truth never helped anyone. Rather, as Pope Benedict the XVI points out, “Only in truth does charity shine forth.” By trying to make the Faith as approachable, as inoffensive, as easy as possible, many priests and teachers have avoided the unique teachings on marriage, on contraception, on the Real Presence, on sin and mercy. At a certain point many wonder, “Well, if it’s no different than anything else, why pay more for a ‘Catholic’ education? Why make sacrifices and suffer through scandals if there is nothing special?” And many do walk away, never knowing what they have lost. Catholic schools need, in charity, to zealously proclaim that we Catholics are different, having “the fullness of truth” as the Catechism says. Pope Benedict follows up with this: “practicing charity in truth helps people to understand that adhering to the values of Christianity is not merely useful but essential for building a good society and for true integral human development.” The bottom line is that Catholic schools can offer what no other place can, and only in proclaiming that will they thrive again. Catholic schools can foster a Catholic culture by truly entering into the liturgical calendar—rejoice when the Church rejoices, hold Eucharistic and Marian processions on appropriate feast days or special occasions. 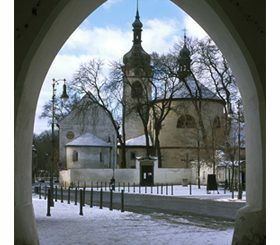 Rejoice in the knowledge that by enriching student life with Catholic traditions (like daily prayer, particular devotions, processions, feast days and fast days, music and song) one enters into a rich heritage, participating in the life of the Church with Catholics all around the world, and going back centuries upon centuries. As Archbishop Miller put it: “Such prayer teaches students that they belong to the communion of saints, a community that knows no bounds.” Catholic schools must also put sports in perspective, never practicing on Sunday, but rather using sports as a virtue-forming discipline. Although not identical to the issue of Catholic identity and culture, the curriculum used should harmonize with the mission of Catholic education. Unfortunately, many Catholic schools have looked to public schools as a standard of academic excellence. A vast number of Catholic schools simply use the exact curriculum used by their public counterparts, and bandage a religion class onto the lump. The United States’ public education system falls far short of excellent, as the US consistently lags behind much of the rest of the world. As Mario Enzler, founder of the New England Classical Academy points out: “What American education is doing…is feeding ‘data’ to students, followed by tests, but it is not actually forming the whole person and nurturing the student’s love of knowledge.” Catholics have a veritable treasury of unique, effective educational resources that value forming well-rounded, virtuous and logical human persons. The Congregation for Catholic Education asserts in its document “The Catholic School,” “The Catholic school is committed thus to the development of the whole man.” To that end, classical education provides perhaps the best alternative to the “data feeding” going on in public schools. One of the great minds to influence Catholic education, John Henry Cardinal Newman, describes classical education as a “process of training, by which the intellect, instead of being formed or sacrificed to some particular or accidental purpose, some specific trade or profession, or study or science, is disciplined for its own sake, for the perception of its own proper object, and for its own highest culture.” One wonders if anything could more perfectly suit Catholic education than the classical model. Catholic schools may also wish to examine their approach to technology. Following the lead of government-funded public education, we’ve unreservedly embraced technology, bringing in individual student laptops, then iPads. Shockingly, many of the creators of the technology fed to American students do not give that technology to their own children. When Steve Jobs was asked how his children liked the iPad, he responded: “They haven’t used it. We limit how much technology our kids use at home.” Ryan Swigart, web designer at Vine, commented: “Technology enhances your ability…to passively absorb stimulation. When you’re young, especially, learning happens better when you’re physically active: not only because it gets the blood flowing, but also because you’re using all your senses, which helps you remember things.” Indeed, many of the tech giants of Silicon Valley choose to send their children to the completely tech-free Waldorf School of the Peninsula. Catholic educators should weigh seriously the fact that many of the best and brightest technology creators choose to avoid the overwhelming amount of tech encouraged at public schools. It offers very little to advance education, and nothing will be lost by postponing its introduction, considering that much of today’s technology is accessible to two-year-olds, and can be easily learned (and limited) at any later time. If a Catholic school can advertise that it offers a classical education, a hands-on, tech-free approach to learning, and a radical Catholic foundation, that school will stand head and shoulders above, and distinct from all its public or charter school counterparts. Catholic schools must be radically Catholic in education. In order for Catholic schools to thrive they must not shy away from the Truth. The Truth will set us free, so let us not be embarrassed to preach it, understanding that though it may initially offend, ultimately the truth is good for everyone and necessary for happiness. Catholics must embrace what and Who makes us different, and in so doing, invite others to enter into our unique way of life. There is a reason to stay Catholic despite priest scandals, and hard teachings on sexuality. That Reason waits, joyfully humble, in every Catholic church, hidden in a golden tabernacle, longing for you to come. Yes, we are different. And it’s wonderful.